Despite of the rain, Oregon OneFecta was on. Sky Siljeg Sad-Plant. Photo Lee Leal, Embassy Skateboards. The Oregon Trifecta, part of World Cup Skateboarding's Bowl series, has switched to Bifecta in 2009, but the WCS still calls that Trifecta. Whatever the name, the Oregon stop of the WCS has become one of the most anticipated concrete contests of the year. Two parks, two days, two contests and a lot of rain. Well, that was the idea anyway. But this year, Bifecta turned to Onefecta because some permit issues took place and West Lynn stop had to be cancelled. Somehow WCS, Sector 9, Chop and crew managed to still have a OneFecta at Pier Park the Monday following the Portland stop of the Dew Tour. 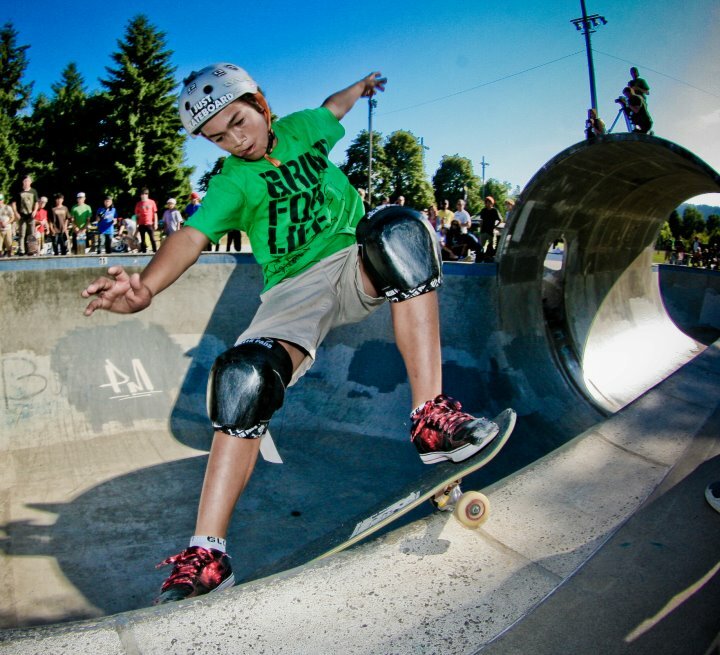 The skating at Pier Park was off the hook! The OneFecta is a grass-roots event. With a small prize purse and a television camera free environment, you get people showing up for the love of skating concrete. And you still get a lot of big names. This year legends like Lance Mountain, Mark Partain and Jeff Hedges joined some of the team painless-padless aka the new rippers on the block (nothing to do with Vans Skatepark, however). And there it goes, the Portland’s Pier Park was full with a mix of girls, old dudes, pros, sponsored and unsponsored ams for some invitational and intentional shredding. Congrats to all the skaters that made the podium and that participated! Skate Tuff! The official results from WCS are below. Pier Park in numbers: 155 official days of rain in a year, 11,500 sq. ft. concrete skatepark built by Dreamland Skateparks includes a 38-foot-long 20-foot-diameter full-pipe with a unique mousehole entry into the side of the pipe leading to nine-and-half and eleven-and a half foot-deep bowls with tile and concrete coping. Five to seven-foot-deep mid bowl and three to six-foot-deep grom bowl with steel coping. Street area with stairs, round and square low rails, granite-topped, concrete and steel edged ledges and banks. Walkwave a skateable walk with banks created by artist Adam Kuby links the neighborhood to the skatepark. Thanks to Lee Leal from Embassy for the awesome pics.